You watch HGTV. 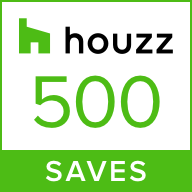 You spend hours pouring through design ideas on Houzz. You have 20+ Pinterest boards organized according to room, color and materials. As a result, you might be closer to thinking that you can design your home remodeling project by yourself. This is very common, particularly from homeowners who are ready to jump into a remodeling project head first. This happens frequently when homeowners “go it alone” in a home remodeling project. They’re so taken with the beauty of a luxurious marble countertop that they install it in a very busy kitchen. Soon, they discover the inconveniences of selecting a high-maintenance marble and wish they’d chosen a different countertop. And that’s just one example of the many design mistakes made by homeowners who forgo working with a design professional from the very beginning. Your professional designer can guide you toward the right materials to withstand your needs in the most beautiful, durable ways. Another way in which your design/build firm can help is to hook you up with the best deals on potential material selections. We have relationships with many suppliers, understanding their lead times, seasonal demands, inventory shortages, etc. We know how to navigate these issues, from lighting and floors to fixtures and lumber to paint and tile and everything in between. We can evaluate whether a deal you’ve heard about really is a deal, or if we can get a better one. And when that happens (as it often does), we’ll look for smarter options for you. We hear this repeatedly from homeowners who try to go it alone in the design process: “We wish we’d used a professional designer to help us before tearing down the walls.” The wrong materials, wrong measurements, forgotten (yet critical) under-the-surface design considerations like electrical wiring, plumbing, and lighting all conspire against homeowners to cause them to have to rip out fresh remodeling work and re-do it. This often leads to thousands of dollars in extra, unbudgeted costs and months of lost work. Getting a design pro on board before you make the first cut helps you minimize these errors so that you can minimize any costs for change orders and spend more time enjoying the results of a beautiful remodeling project done right the first time (like the ones in this home remodeling portfolio). Using your professional designer’s expertise up front is an investment in wisdom that will last for years to come. While you may have spent a lot of time watching HGTV or wading through design magazines, the truth is that these media outlets filter the information. There simply isn’t enough time and they have to use advertising dollars to make decisions about what they present. Here at Riverside Construction, however, it’s our business to know about all the options, from materials to design considerations, long before you might hear about them on TV. Also, if you hear about a new material or have a design idea you heard about on one of your favorite shows, you can bounce that idea off of us and we can give you guidance on whether or not that would work in your project, or if there’s a better option for you. A lot of people still think about seeing remodeling plans in a flat, two-dimensional perspective. But Riverside Construction has gone way beyond that. We employ 3D design technology to help homeowners “see” their options and what the finished product can look like, even in the very beginnings of the planning stage. Using these proprietary tools, you can benefit from an inspired preview of your finished project as well as head off any potential wrong decisions, saving you thousands of dollars and time in change orders. These advanced tools simply help you understand the ins and outs of each design aspect of your remodeling project—before the dust flies. These tools also help increase measuring accuracy, which helps you use your available space in the most efficient way possible while avoiding common design mistakes that can leave you frustrated and disappointed. Aside from helping you choose the best materials while getting the best price on all the aspects of your remodeling project, not to mention avoiding grave measuring and under-the-surface errors, there are a lot of great benefits you receive by working with a design expert in the planning stages of your home remodel. We can help you use each space in the most effective, convenient way possible. We can even create space you didn’t know you had or increase your storage capacity and make your living space fully functional. Ultimately, the end benefit is designing a space that you will be happy with for many years to come. If you’re not quite sure where you want to go with your home remodeling project, you can also sign up for our newsletter to get inspired until you are ready to remodel. And we are happy to share our knowledge with you! Sign up for our next home remodeling design seminar—it’s free, but space is limited, so make sure to grab your spot now. Or, schedule a consultation to discuss your remodeling design project in person today at (765) 838-1644. Many homeowners can feel overwhelmed when embarking on a home remodeling process. Where do you even begin? There’s so much to think about! And, once you decide to move forward, what can you expect in the way of working with a designer? Get an inside look at what it’s like to begin the design process, and the advantages of working with a design expert, from our very own in-house designer, Kelly Grish. We will measure the affected areas of your home and ask you deliberate questions that will result in a clear understanding of your needs for the space. Questions we might ask include, “What are your must-haves? “Nice-to-haves?” “What is working?” “What isn’t working?” “What are your biggest challenges with the space?” “What are you hoping to see changed?” “If you could do anything with this space, what would you want to do with it?” While we are in your home, we will also be looking to get a sense of your personal design style, color preferences, and making sure the new remodel ties in with the rest of your home, and your home’s architecture. Homeowners are commonly concerned about cost. They are seeking my help in finding the best way to add value to their home, improving their living space, all the while keeping within their budget. Pretty darn good, actually. That’s one of the primary benefits of working with a design/build firm. That answer depends on what you want. Are they structural changes? Do you want to knock down a load-bearing or non load-bearing wall? Are we moving a wall with plumbing or electrical? Every space is different. As a design/build firm, we can make suggestions for changes to the design that fit within the your budget. For example, we had a client that wanted to remove a soffit that had plumbing in it. To save money and make her project affordable, we designed the new kitchen cabinetry to hide the soffit instead. While the client preferred the soffit to be removed, the end result was that the ceiling no longer looked too short and our work-around kept the cost of the remodel in line with the homeowner’s budget. We start by meeting with you, listening closely to what you like and don’t like about your home. We also discuss your hopeful timeline and budget. After a budget range is provided, we measure your space and narrow in on our design preferences. We take all of the information and transform them into a blue print—a space plan. You review the new concept drawings, brought to life through 2D plans and 3D renderings. We then follow up with a project budget proposal and start working with you on making final selections. Upon your approval of the final plans and specifications, we order materials, start the permitting process, and schedule your project to start. As an interior/architectural designer, I make interior spaces functional, safe and beautiful by determining space requirements and helping people make selections such as colors, lighting, cabinetry, flooring, fixtures, etc. More importantly, I help homeowners with style selections that make their new remodel blend cohesively with the rest of the home. Function is a huge aspect of what I do. No matter how beautiful a space is, if it doesn’t function properly for the homeowner, it is not a good design. Achieving better function in a space might include removing or moving existing walls— when budget allows. As an architectural designer, I also work with CAD programs to make sure that building designs are feasible—drawing blue prints and measuring your existing space. I do almost everything (redesigning an existing inside structure) with the exception of HVAC and calculating load-bearing points. It is usually possible to determine if a wall is load bearing or not based on its distance from an exterior wall. However, if a wall were to be removed (all walls can be removed, some are just more expensive than others) I would need the expertise of an engineer or architect to specify the type of beam needed to span the space and carry the load. I do have the qualifications to create an electric plan and make the perfect lighting plan for your home. Q: “How do you help homeowners make their selections? First of all, Riverside Construction has a fabulous showroom, which I invite homeowners to—where you can touch, feel and compare a selection of cabinets, and countertops. We also take our clients to a local flooring store to select carpet, tile and wood flooring in person. For plumbing fixtures and lighting, we can effectively shop for selections online and at the homeowners request we are able to take advantage of a few local show rooms. Q: “Do you recommend homeowners spend some time on their own narrowing down their design likes and dislikes, before meeting with a designer? Yes, I do recommend that homeowners do a little homework up front. If someone wants to change the style of his/her home, then seeing it in person doesn’t help. Being able to look at finished project photos and material samples that portray the design style that the homeowner prefers is a big help. Q: “What websites, magazines or books do you recommend homeowners use to identify their design style? The main sources to rely on are Pinterest, Houzz, and doing a Google Image search online. There are also several remodeling magazines that provide some great ideas, like Kitchen & Bath Magazine. In a lot of cases, homeowners are not sure what they want. If space is open and connected to other rooms, I’m looking at their existing color selections and seeing how we can tie the color of the new space into the rest of the home. In other words, what exists in the home drives the design, to some extent. It is also very common to start with one item, like flooring, and determine what their preference is. After two or three selections, we can see what they like. It’s not uncommon for homeowners to be a little shocked by the cost of materials. We are really good at educating people on the actual cost of things. And, after showing them how much something is, we offer alternatives that result in a similar look but are not as expensive. For example, a client may really want travertine tile until we show them a porcelain tile alternative that looks similar at a fourth of the cost. The biggest benefit of working with a design/build firm is that we tailor your home remodeling design to your budget. There are many architectural firms. They may do a great job of producing a beautiful design project, but may or may not take into consideration the best way to design your space affordably. A design/build firm encourages your active participation in the design process so that if your budget won’t allow it, we’ll come up with an alternative design to make it work. Then, we take care of everything from start to finish. If you were to take a plan from an architect, then you would need to find your own contractor. The kitchen continues to be the center of the home. It’s where people like to congregate. As a result, we’re seeing a lot of people requesting islands with bar seating. Homeowners are getting rid of soffits, to create more space. They are using under cabinet lighting, and many are choosing the fresh, clean look of glass or ceramic tile backsplashes. We are seeing less Corian in the kitchen, and more quartz and granite. Many homeowners are choosing to use tile or wood plank vinyl—a smart choice that typically water resistant. The colors, grey and beige are still big in Lafayette. Taupe, a mixture of the two colors, is also popular. A lot of people don’t want to renovate again. These neutral colors are popular colors that stand the test of time. White cabinets are also very popular. Our cabinet manufacturer is currently delivering 70-80% shaker style white cabinets. We are also seeing some requests for darker wood cabinets. If homeowners have a tub somewhere else in there home, they are doing away with their master bathroom tub and replacing it with a large, walk-in shower. We’re also seeing a lot of floor to ceiling tile and glass wall shower partitions, which make the room appear larger. Storage is always a must. We are forever finding creative ways to add storage to bathrooms. With the New Year, it’s only natural to feel a renewed impetus for change. It’s the perfect time to channel your energy into that remodeling project you’ve had on the back burner. Kitchen and bathroom remodels are popular, but an unfinished basement? Now THAT’S promising! Think of your unfinished (or partially finished) basement like a blank canvas. Paint in a gym, a studio, an office, or a “man cave” – to name a few ideas – and imagine the endless hours of enjoyment you and your family will find in the finished space. Whatever your downstairs dream room is, the possibilities are practically endless. Here are some exciting ideas that combine fun and function. Scroll down and get those creative juices flowing! Who doesn’t want a room devoted to kicking back? Whether you have a growing family or you simply enjoy entertaining guests, the basement is an ideal space for a fully loaded media room. With an adjacent half bath and a custom bar or kitchenette for drinks and popcorn, a media room brings a new functionality to your home. Enhance the space with a large screen TV, a custom projector, audio system, plush carpets, and a comfy couch, and your new media room is bound to draw guests and family alike. Are you into crafting, sewing or other artistry? Turn your unfinished basement into a large sewing or crafting space with large workspaces, ample task lighting, and plenty of custom storage options. Whatever your hobby, a finished basement provides added function, versatility, and – best of all – designated places for everything you need at hand. It’s every sports fan’s dream. Heck, it’s every man’s dream. If you drool over a secluded retreat of your own, your dark and dreary basement can make those dreams come true. Remodel your basement into the perfect man cave using hard wood flooring, back lighting, custom bar and beverage refrigerators, shelving for sports memorabilia, granite countertops, and a fireplace – to name a few ideas. The clubhouse days are over, boys. Welcome to the big leagues. Getting to the gym can be difficult. But with a home fitness studio, there are no excuses. Installing the appropriate flooring for exercising and some custom cubby storage for your gear means you can ditch the excuses and catch a workout at a moment’s notice. Whether you’d rather revel in the added privacy, or invite your friends to hang, you’re guaranteed to reduce the distractions – and the germ count – while still getting in your daily reps. Working at home doesn’t have to be a drag. On the contrary, remodeling your basement into an inspiring home office is one of the best things you’ll ever do for you. With great task lighting, a built-in desk, bookshelves, and wiring for all of your technology needs, you can work with ease in the comfort of your own home. Every house can use an extra bedroom. Whether you have visitors from out of town or just down the street, a guest bedroom is essential. Give your company the luxury escape they crave with great closet space, an adjacent bath, and reading nook in warm, neutral tones that everyone can enjoy. Your guests will thank you for a great night’s sleep in their cozy retreat. Better still, they’ll never guess their ultra-chic sanctuary could ever have been a dark and scary basement! Have you recently acquired a resident musician? A renovated basement can provide a much-needed space for jam sessions with plenty of storage for instruments and equipment. Consider designing a basement practice space that preserves the peace with soundproofed walls and flooring. Game rooms are great for kids and growing families, providing a convenient space to entertain and hang out. With the essential functionality of a half bathroom, kitchenette, an entertainment center for movies and video games, and a selection of seating areas, a game room means fun for the whole family. Better still, a basement game room can keep you enjoying outdoor sports – even in bad weather. With a miniature indoor sports court complete with the appropriate flooring and padded walls, kids can keep on practicing all year round. Devote your basement remodel to inspiring your little ones with a playroom of their very own. Design custom playhouses and chalkboard walls to keep the magic of early childhood alive. Using pony walls or custom furniture, you can create designated play areas for a variety of activities. Don’t be afraid to use your imagination. Consult your kids, too! In the end, their fairy tale playroom will be your peace of mind. You don’t have to be a connoisseur to appreciate wine, but those in the know will surely covet a custom, built-in temperature-controlled basement repository. What better way to add a touch of class to your home than with a luxurious wine cellar complete with proper storage, display cases, and a seating area? Consider transforming even a small, unused space into the ultimate wine cellar with special touches like rope lighting, unique countertops, and a coffered ceiling. Need a better space to do laundry? Consider designing the ultimate laundry room as part of your basement remodel. A well-lighted folding station, a custom drying rack, and a built-in ironing board go a long way to making chores seem less tedious. If your basement has a ground floor entrance, you might even consider an adjacent mudroom or a dog washing station. An in-law suite is a separate living space within a larger household. It usually includes a bedroom, a full bathroom, seating area, laundry area, and a kitchenette. Converting your basement into private living quarters is ideal for resident family members in need of a independence – with all the benefits of living just downstairs. At the very least, a basement renovation is the perfect opportunity to enhance your home storage systems. Goodness knows one can always use more practical organizers! From custom built-ins to open shelving, don’t be afraid to utilize every nook and cranny – including under the basement stairwell. For more specific details on how to finally transform your “empty canvas” basement into your very own masterpiece, check out this article on reclaiming your basement. Then, take the first step toward your new basement space and schedule an in-home meeting with your very own personal design consultant.